I had originally listened to the Cobalt 806s but didn't have the $1100 the dealer was asking for them, so I went out and bought another, less expensive pair or speakers by NHT. The NHT were okay but I still wanted the JM Lab. I stumbled upon a pair of Cobalt 807 on Craigslist for a nice price and gladly picked them up. I've lived with them for about 3 years, and am very happy with the sound. They have such a fast, liquid tweeter and the midrange is outstanding as well. The bass is there, but obviously in a speaker this size it will not rattle the walls. I matched them up with a Definitive Technology SuperCube series subwoofer to fill in the lower octaves. I started using these with a Sony DA4ES receiver, then went to a Harman Kardon AVR-7300, then a Cambridge Audio Azur 840a integrated amp, and finally some Aragon separates. Each improvement in equipment quality has brought out more in these speakers. I brought them to a friends to hook up to 14k of Naim equipment, and guess what, they sounded still better. These are overachieving speakers, and will step up as your system evolves around them! Detailed,Good bass for a little speaker, solid build and good sound staging. I'm using this speakers for rear chanels, and they are exelent for rears and pretty good for fronts. Exelent for people who want to have mini monitors and good value for money, but you have to have good amplifications and cabels to fully appriciate quality of this speakers. This is a good product from high end compony and doesn't cost a fortune even much better than a bigger speaker for the same monny, belive me I've heard a lot of different speakers in any price range. Anyway, the bass sounded very deep, extended and tight in my dealer's shop but unfortunately in my room (though still very deep and extended) seems not so tight. The treble is very nicely refined and the midband is great too. Great airiness as well. I'm waiting to bring it to another friend's (bigger) place to see if the bass sounds tighter there. But for those with small rooms, I would strongly suggest listening to the afore-mentioned Audience 40 (or Contour 1.1). I think these speakers are excellent. However, I agree with the previous review about the size of the room: you shouldn`t use these little babies in a small room, and you should certainly keep them at 30-40 cm distance from any wall, otherwise you might be really disapointed with the bass. Except from that, I personaly think they are superb, and will thus rate them 5 stars. I've owned the JMLab Cobalt 807's for 6 months now. They sound absolutely wonderful with acoustic music, such as pianos, folk music, classical, and voices. They sound good with light pop, but are not as excellent on harder rock and other music with lots of distortion. As a big Radiohead fan, I can hear things in the music with theses speakers that I have never heard before. Vocals are clear and centered. Highs are mellow yet very defined. Bass is terrific -- not boomy but yet very deep for speakers of this size. Note: My amplifier is a budget priced Sansui receiver rated at 70 watts/channel. I have a feeling these speakers will perform better on demanding music with better/higher quality amplifiers. I auditioned them in store on an ARCAM Alpha 9, and that is what sold me on them. Smoothness, imaging depth and stability. Not-perfect dynamic range, even with subwoofer. Lack of deep bass if used alone. Let me get to the overall 5 star rating first; this is a small 7-inch 2-way mini-monitor type speaker. It doesn't have the highest amplitude ability in the world, nor the deepest bass. No mini-types do. Within the design criteria of this speaker, however, I have heard only one speaker better: the Scientific Fidelity Crown Joule. The 807 is happy with 100 watts of power; the Sci-Fi CJ needs at least 3 times that. And high powered amps that sound good are expensive. The 807 sounds good with Myryad, NAD and Jolida amps. It sounds even better with the YBA Integre, Bryston and Classe amps, and Musical Fidelity. 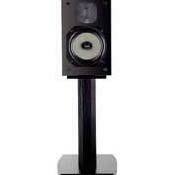 To whit: the soundstage of the 807s extends past the speakers vertically, hoizontally and has great depth. Not only that, but I am one wont to roam the room while listening: the soundstage of the 807s is extremely stable and consistent. There are no crossover-related artifacts that I can hear, unlike Snells and KEF speakers. Most importantly, the 807s are speakers that do not have a single,overriding flaw or liability that destroys a person's sense of satisfaction. They may not be the best in the world at anything, but they're pretty far up there at anything, considering their design. No comb filtering like the Alon Adrianas, which are $10,000 list. Fuller bodied than the Thiel SCS3s. Listen to any one of several recordings of 1) Brahms' 1st symphony,1st movement. 2)Bach's Tocatta and Fugue in D minor. 3)Smetana's Moldau. 4)Mozart's Eine Kleine Nachtmusuk. Altho the power and majesty, the delicacy and life, or the sense of venue and space all come through, you can still hear the differences of placement, lateral reverb and in some cases even the editing artifacts that are on the recordings. Most speakers that are good eneough to let you hear editing are so analytical that you can't stand them. Not the Cobalts. Smoooooth. If I could stand to lock my head in one place, I might take Vandersteens or Dunlavys. But I can't, and can't afford them. I'll take the 807s anyday. Snell K5, Paradigm Active 20, Paradigm Export Monitor and KEF Q15. I use these speakers as part of my home theater system. I have Cobalt 807 for front, CC20 - center, SR 20 rear and SW 27a sub. When I listen to music, I use just the front 807s. To get the best out of these speakers, this is how I listen: I have them on a 31 inch stand, mounted on spikes; they are 9 feet apart and about 3 feet from any wall; if I draw an equilateral triangle, I sit at one vertex, on the floor such that the center of the speaker is about 9 inches from my ear level. Listening to these speakers is pure magic. It is very accurate, focused and detailed at the high frequency levels (trbl) and very clean, pure and well balanced at mid and low frequency levels. At low frequency levels (say 120 Hz) the bass is a little loose, mind you these are no $10,000 speakers. First I used sony strda777es receiver; switched to Lexicon DC2 preamp and Bryston 9bst THX amp (paid 5.5 grand extra). Amp does make a lot of difference to the quality of music that comes out of these speakers. I am more than happy with these speakers, could not have done any better. It is worth every penny I paid for it ($824.00). It took me 2 months of auditioning before I found these 807s, but it was worth the search.